It seems that Internet TV is a very hot topic at the moment and it shows how media convergence is including more and more industries. Of course there are opportunities and at the same time threats for the incumbents. TechCrunch posts Internet TV and The Death of Cable TV, really. The boundaries between Internet and TV are blurring. From watching a video streamed from YouTube or watching a TV program there is not much difference, especially when they are both watched from the same media, the TV. Companies offering streaming services are booming. Examples are YouTube, Amazon Video on Demand. Hulu (from Wikipedia: Hulu is a joint venture of NBC Universal (General Electric/Vivendi), Fox Entertainment Group (News Corp) and ABC Inc. (The Walt Disney Company), with funding by Providence Equity Partners, which made a US$100 million equity investment and received a 10% stake.). Netflix, founded as a DVD rental company is now a strong player on streaming movies. Than Pandora, Spotify, Slacker are some of the music streaming services. Basically, the cloud is becoming more and more important, I would say essential in many of the Internet services. People want to access their content whenever and wherever they are, in front of the TV, a mobile phone or PC. Companies offering an integrated and seamless experience have an advantage. For example. From the Google TV, I have access to the pictures on my Picasa account and I can show them on the bigger screen. By performing a search with the Google TV I have results coming from TV programs and the Internet (including my search history of the desktop) and streaming services. When I check an address on Google map, I can mark it with a star. This information is stored in the cloud, so when I use the Google Navigation system with my Android mobile phone in my car, I can use that bookmarked address to reach the destination. A lot of interesting scenarios and potential. At the same time, to get some of these services we need to reveal information about ourselves. Privacy and the respect of it will be one of the most important issues going forward. Interesting times ahead, looking forward to seeing how the Internet TV will evolve. 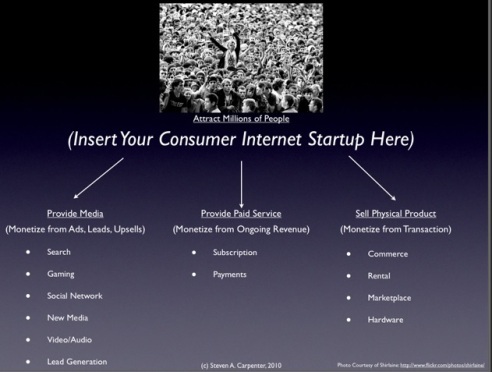 Interesting post in TechCrunch by Steven Carpenter on business models. See also the table from the article, showing the 13 consumer Internet business models. Seth Godin has written an interesting blog post The business of software. His blog is a must. it’s become clear that software alone isn’t the point. There isn’t a supply issue–it’s about demand. The business of software is now marketing (which includes design). COMMUNICATE TO USERS: As we’ve seen in just about every industry, marketing involves effectively communicating a story about benefits to (and among) the people who will appreciate them. For software entrepreneurs, this means identifying a group of people who need the utility of what you can offer them and who are willing to give you permission to educate them about why they should buy. Without either element, the software is dead. Is the product so remarkable that they will talk about my product with their peers? Can I earn and maintain permission to continue the conversation? Once they learn about the utility offered, will they pay for it? Does the connection this enables create demonstrable value? Is there an easy and obvious way for someone who benefits to recruit someone else to join in? Is it open enough to be easy to use but closed enough to avoid becoming a zero-cost commodity? 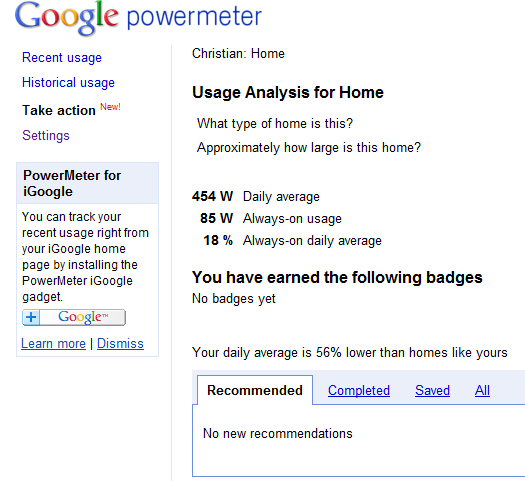 I wrote about Google PowerMeter and the Smart Grid concept in April in a blog post with the title Smart meters are a reality . 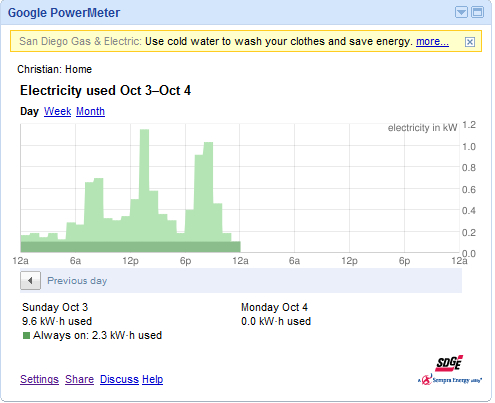 Now I have some screenshots of my consumption from the PowerMeter in my iGoogle page. It is not a smart grid but this is the first step. PowerMeter makes consumers aware of their electricity consumption and offers suggestions on how to lower it. And it is a nice idea of adding the competition element of earning badges if consumption diminish.